So much focus is put into long game that we sometimes forget just how important putting can be. 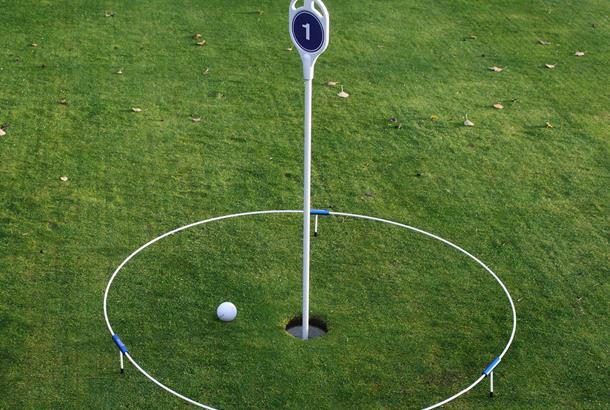 Sadly, we can't all adopt Tour pro's attitude and spend hours on the putting green every week but these easy to use training aids can go a long way to improving your putting skills. 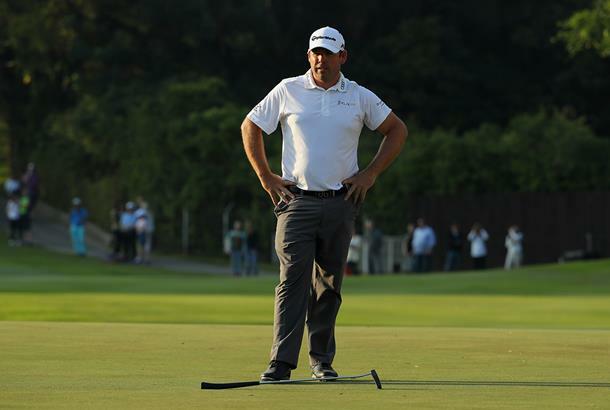 Make sure you check out our collection of our best putting tip videos and soon you'll be holing more putts every game. The tips include quick drills you can practise in your own home, to the importance of posture, and how to putt under pressure. We've all watched the pro's putt using a line on their ball to help alignment. Clearly alignment is key to successful putting. There are plenty of plastic products with a slot to draw the on the market, but what happens if your pen is blunt? It doesn't work. Whilst drawing a line they often slip and mess up the ball, and if you want to draw a longer line than the slot allows you have to remove the tool and re-align it. Well, we've found a solution. The LineFix360 is CNC machined from aircraft grade aluminium to provide an accurate ring for the ball to sit in. So accurately machined, in fact, that with a gentle bit of pressure the ball is gripped in place allowing you to draw your line to whatever length you please. It's simple and accurate and can be tied to your golf bag so you'll never lose it. So, you've got a perfect line on your ball. All you now need to do is place it on the green on the line you want to putt. But when you come to place it and stand back the line is not vertical. You try again, annoying your playing partners with the time you are taking. In the end you may even putt with it off line to keep play moving. 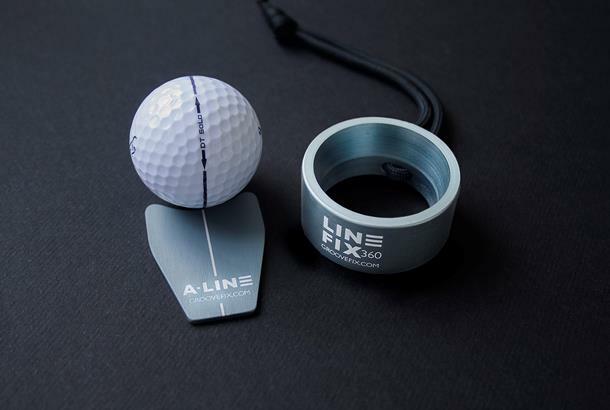 We recommend the A Line ball marker. The marker, again made from aluminium, has a laser engraved line on it so as you mark your ball you can use the line on the marker to chose the line of the putt. After that all you have to do is clean your ball and replace it aligning the line on the ball to that on the marker. Easy! Here's a piece of kit that will help ensure you strike the ball with a square face at the point of impact. Place the 'Right Angle' putting aid on the putting green or carpet. Balance the ball in the locator and align the line on the ball with the line on the device. 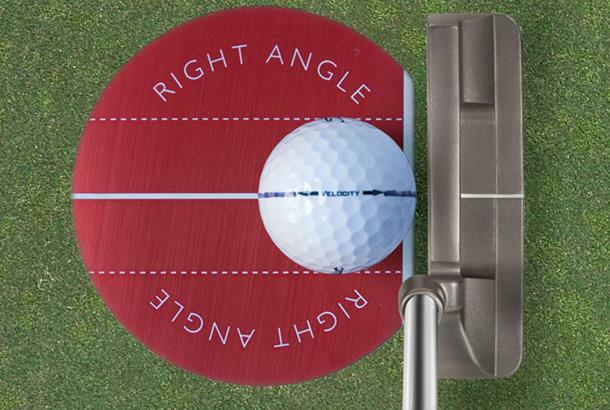 Using the square edge of the 'Right Angle', align your putter so that it sits square to both the ball and the putting aid. Practice putting through the line of the ball. If you don't have a golf hole to aim at you can use a second 'Right Angle' to represent the hole. They have been engineered to precisely 4.25" (the regulation size of a golf hole). Try setting up different lengths of putt with various 'breaks', adjusting the angle of the two 'Right Angle' aids to establish the desired exit line and entry points. A putt that crosses the entry point would 'drop. The lip out zone is defined as half the width of a ball from the corner of the entry point. Putts crossing this point would be likely to miss. Ok, not the confectionery. This is a purpose made disc with a smaller hole in its centre designed to improve your shorter putts. 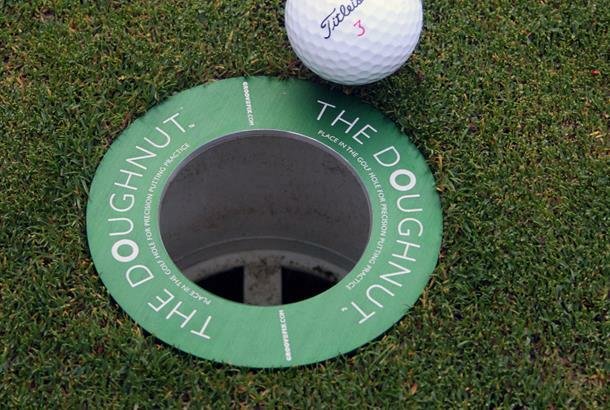 Place 'The Doughnut' into a cut hole on the practice green so that it sits flush with the surface.' The Doughnut' is precision engineered to be exactly the size of a regulation hole (4.25" in diameter). It fits snugly in the hole and will have no problem maintaining its position. Practice putting to the new smaller hole. The new hole size is 62mm (approximately one and half times the diameter of a golf ball). Only the most accurate putts will drop, providing positive feedback on the number of putts that hit 'dead' centre. Remove the device and the regulation hole appears to be a much bigger and easier target. We've all been told to imagine a dustbin lid around the hole to visualise a larger taget when 'lag' putting. The 'Ring-O' is a training aid which allows you to carry a portable ring to provide a real guide when practicing. It's light and easy to transport. Simply plug the three components together to create a circle ensuring the legs are in the same vertical position, then place the RING-O on the practice green so the hole is at its centre. Practice your long putts aiming to stop within the target. As the RING-O 'floats' the ball can pass beneath it giving a true measure of distance and accuracy. As the item is modular, you can add further 'legs' to make larger targets as required. 5. Practice at home, in the office or hotel! Now you've no excuse for not practicing your putting, whatever the weather. 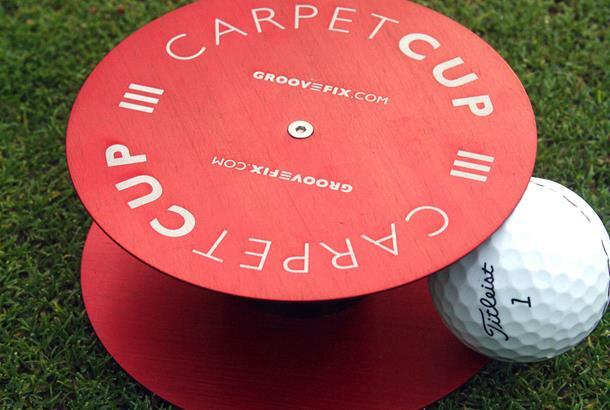 The 'Carpet Cup' is a portable practice hole designed for indoor use, but may also be used on the practice green should you so desire. Made from aluminium it is precision built to the size of a regulation hole. The two discs, also made from aluminium are spaced apart by a solid bar of, you guessed it, aluminium. They are accurately positions so that a golf ball will be 'trapped' between them if hit on line and at the right pace. Too hard to the sides and the ball will pass by indicating a 'lip out'.